I wrote some time ago of the draconian powers being mooted for the ODA's Boot Boys, a private army of 'enforcers' who are being empowered in regulations made under the Olympics Act to tear down, cover up, confiscate, exclude and hide any advertising or message within the Olympics Zones that challenges the official sponsors. Olympics sponsors have sole right to display their brands and logos within the zones, and the government are making sure the Boot Boys have powers to prevent any 'ambush marketing' by competing brands trying to sneak into camera views of the VIP convoys streaking down the Zil lanes and suchlike. The appointment of Heineken as Official Beer Sponsor will give the Boot Boys a hoppy conundrum. You see, across the whole of East London the local breweries used to proclaim their houses from afar by the prominent badging at high level of gable walls and the like. 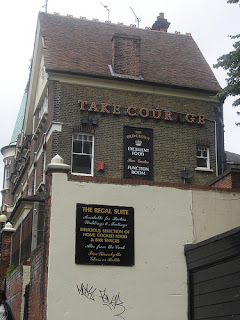 'Take Courage' is perhaps the best known, but Fullers, Ind Coope and others still decorate East London's brickwork, as prominent as you like, and as permanent. I'd imagine any attempt to cover over, obscure or remove such brand advertising within the Olympic Control Zones would result in popular fury - particularly since the official beer is 'foreign'. And if they're going to be left alone, it's an ideal opportunity for Britain's brewers to, er, refresh them a bit before the games. Maybe some neon. Or flourescent paint. C'mon guys - let's give the Olympic sponsors the finger. How much waste needs to go to landfill? When talking about waste and landfill there are a few basic definitions that need to be understood to make sense of it all. The first is to understand the term arisings. Included in the figures for arisings is waste that's immediately reused or relocated on site, such as the product of dredging a river or canal which is deposited on the bank, unsaleable mineral and mining waste that is dumped elsewhere within the mine or quarry, and construction and demolition waste that is spread on site or crushed and reused elsewhere. Waste arisings from industrial processes frequently have a residual value and are re-sold or reused, and other industrial and commercial waste can be profitably recycled. Thus of the estimated 335 million tonnes of waste arising in the UK each year, only a small fraction needs to be disposed of. Secondly, not all waste that needs to be disposed of can be sent to landfill. Medical, clinical and biohazardous waste needs to be incinerated and toxic and radioactive waste similarly needs special treatment. However, both these categories are so small in overall tonnage terms that they can be ignored. Of the remaining waste for disposal, much will be inert, such as demolition rubble, and can be disposed of near to people and close to watercourses without risk. The remainder of household, commercial and industrial waste that may rot or that contains pollutants or products of decomposition that fall below hazardous can be disposed of in dry landfill. So how much of that 335 million tonnes needs to go to landfill altogether? In fact, the household figure is too high; it's actually the figure for what's termed municipal waste and includes both household waste and a proportion of commercial and industrial waste where councils collect and dispose of this as well, so there's some double-counting. But no matter, let's stick with the higher total. Where does the landfill capacity come from? Landfill sites come mainly from the activities of quarrying and minerals extraction - holes in the ground. Generally, hard-rock and opencast coal sites will tend to be dry and suitable for all types of non-hazardous waste whilst sand and gravel workings are frequently close to the water table and will be mainly suitable only for inert waste. The following figures are for the annual quantities of products sold, i.e. the quantity of space created by materials leaving the quarry gate. Unsold excavated material that is redistributed elsewhere in the workings is not included. You will have noticed I've converted tonnage to capacity; this is important in the next section, in which we compare the capacity of annual space created against the capacity of waste requiring landfill disposal. But you will see that we take some 246 million tonnes of stuff out of holes in the ground each year and need to put 62 million tonnes of stuff back in. Is landfill in the UK running out? This is where we need to watch our figures. Firstly, we have lots of empty holes in the ground left over from two centuries of industry and development. So total capacity is the sum of the existing capacity plus the new capacity created each year. Then there's a big difference between licensed existing landfill capacity and actual existing landfill capacity; not all quarries and mineral workings are licensed to receive waste. And then there's the frustration that England and Wales, Scotland and Northern Ireland all report their licensed capacity separately, and whilst England and Wales report in terms of volume, Scotland reports in tonnage terms. The mass density of compacted household waste will vary widely, but from a number of studies a density of around 0.77 tonnes / cubic metre can be assumed. Construction and demolition waste will be denser, around 1.0 tonnes / cubic metre. 3. There is no shortage of landfill in the UK. Given the above, if you fancy fisking silly, poorly researched scare stories such as this one in the Guardian, be my guest. I can't be arsed. Pictured below is the most pertinent and subversive threat to the Leviathan Central State. 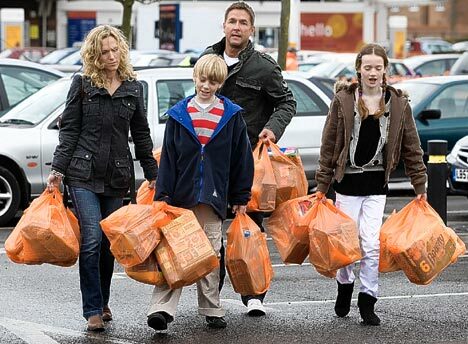 The ordinary British family may appear to be in retreat, its very existence under sustained assault from the forces of Statism, but it's proving stubbornly resilient. Labour's years in power were no more than one, long campaign to destroy the family, to achieve the dream of that deluded rogue Rousseau to shatter the bonds between parent and child to form direct bonds between each individual and the State. Clegg also hates the family, fears the power it holds. Milliband loathes the very idea of family to the extent that he'd rather leave his children as bastards than marry. For this reason, the nuclear family has normally been supported by the Conservative Party – and, of course, hated by progressives. From 1997 onwards, New Labour waged war against the family. Gordon Brown (in a financial statement deceitfully tagged “a budget for the family”) abolished the married couple’s allowance, replacing it with a system of tax credits which viciously punished couples who insisted on getting married. After the 2001 general election victory, New Labour felt confident enough to obliterate marriage from the official record. The term “marital status” suddenly ceased to appear on government forms, a seemingly innocuous move that went unnoticed at the time but has been full of consequence ever since. Thereafter, the British state no longer acknowledged the institution of marriage as being in any way different from other kinds of connection between couples. For years, we've asked why the French and the Italians had higher-achieving, less problematical, better behaved and more socialised children, and the answer from the political class was always that our State wasn't intervening enough, wasn't controlling enough, wasn't spending enough. What rubbish. The truth is obvious for all to see - it's because these nations have traditionally had strong families to stand against the State. Robert Nisbet wrote "The war between the family and the state is very old. When one is strong, the other is generally weak". And this is the core of our way forward; the classic economic liberalism of the Lib-Dems, greater sellers-off and privatisers than even Thatcher, will come to nought if it's not combined with classic social Conservatism that boosts the family as the building block of our nation. Only together will economic liberalism and social conservatism succeed in shrinking the State. And the sooner we admit it, and the sooner Clegg and Cameron articulate it, the better. Well, it didn't last long, this new regime of honesty and financial probity. MPs have had enough of having to account to the public for their spending, and are unwilling to stand for being revealed as mean sods on £65k a year who still submit claims for the cost of a single newspaper or a pint of milk. They long for a full return to sleaze and corruption, to unaccountability, to greed and waste hidden under a cloak of lies and obscurity. King of the Sleazeballs Sir George Young (why the Hell wasn't he culled last time round?) claimed that the requirement to be honest and accountable was deterring poor people from becoming MPs - implying that the sleazier, the more corrupt and the more obscure the system became, the more attractive it was to poor people. That's not a great argument, George. And as constituents push their way past the bulk man-high stacks of bum-wipe bought by Bob Russell for his constituency office they may consider that it will take longer than the life of this Parliament for Bob and his official constituency support worker to get through it, for had he bought it for the use of the local party as well it would make his expenses claim unlawful and criminal. I expect Bob is now recording three sittings a day to justify this purchase. The whining bunch of bent shits calling for IPSA's abolition may well have the power to vote it out of existence, but they forget who they're really answerable to. And we've had enough. 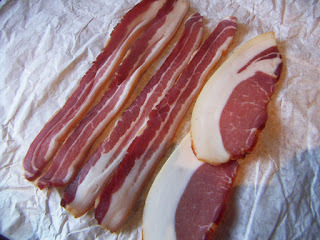 Scientists who have been long advising that smoked and cured meats including sausages, bacon, ham, salami, speck, kippers and the like are harmful because they contain Nitrates are now advising us to eat lots of Spinach, because, er, it contains lots of Nitrates which, it turns out, are good for us after all. Good. Glad that's clear, then. A week on from the promised release date of 26th January and the Electoral Commission's report on election fraud at the 2010 election remains secret. Why? They're not saying. Meanwhile, further evidence that the UK's third-world standards of electoral probity, so valued by the corrupt Labour Party, comes from evidence that 28% of candidates at the last election thought voting was unsafe from fraud and abuse, and 24% of candidates and agents were concerned about electoral fraud and abuse in their constituencies. Fraud has rocketed since the introduction of postal voting on demand, and is concentrated in Labour areas, frequently amongst Labour's client immigrant populations. Our primitive standards of voter registration have left us, by Michael Pinto-Duschinsky's estimation, with 3.5m people on the roll who shouldn't be and another 3.5m missing from the roll who should be. Add electoral fraud to the scandal of Labour's rotten boroughs and despair at what this nation, once the mother of democracy, has sunk to. Can we get any lower? As suspected, Cameron has sold his soul for the nonsense of preserving a change to AV voting. To secure this concession to his coalition chums, it is reported that he has given the foully corrupt Labour Party their way on preserving an unfairness in our electoral system so undemocratic that the UK is 'off the scale' amongst advanced democracies according to Michael Pinto-Duschinsky. The glacial pace of progress of the Boundary Commission under Labour was not accidental. The very last thing Labour wanted was changes to their rotten boroughs that would end the unfairness of a Labour vote in a Labour rotten borough being worth several Tory votes in a normal constituency. All their filibustering in the Lords has been in defence of this indefensible inequity, and not at all about a change to AV voting. For Cameron now to surrender on plans to reform this corruption solely to keep the AV referendum is shabby and shameful and will do nothing to convince the people of this country that the chummy corruption of the political class has ended. The political class, we are told, have reached a deal on the AV referendum Bill. One hopes beyond hope that the changes are to the AV part of the Bill, and not to the important bit - the move to equalise the electoral quota to within +/- 5% in all UK constituencies by the next election. This is the truly important bit; the AV vote just changes something that works, something that isn't broken, whilst the constituencies part of the Bill reforms a deeply corrupt and untenable inequality in our democracy. If Cameron's lords have frozen these measures to tackle electoral and political corruption, I shall be bloody furious. And where the hell is the Electoral Commission's report on corruption during the 2010 Election? It was scheduled for their website for 26th January, and is not there yet. I don't trust a single one of the corrupt bastards an inch. Dominant Western cultural revolutionary themes consist of the usual suspects: racism, multiculturalism, feminism, the normalization of homosexuality, equalitarianism and so forth. What is remarkable, though, is that while state sanctions may play a role in later stages of what elsewhere has been termed “Cultural Marxism” (Gabb does not employ this terminology), it is the general citizenry's internalization of this new way of thinking that creates the ground for whatever subsequent sanctions may be necessary for those “just not getting it.” Older citizens who, in private, may express completely antithetical (that is, traditional) views will, when confronted openly, proclaim their support for new cultural norms. On the other hand, having been already schooled within the revolutionary milieu, the newer generation understands “instinctively,” and needs no convincing. For them, “new ideas” are self-evident, and not new at all. At the same time, Gabb holds that the ruling class, for their part, may well be completely cynical. Nations, taking the word in its traditional sense, are incommensurate with Neo-Marxism. This is because nations are comprised of more or less homogenous, like-minded groups founded within a shared organic tradition. The break-up of the nation-state is, because of that, essential. In fine, Neo-Marxism wages a “war against the past.” Traditional culture becomes deprecated, and those hitherto associated with the tradition must be made to feel both ashamed of and responsible for the crimes of their fathers. Self-criticism in the form of agonizing over racism, colonialism, sexism, environmental degredation, and all the rest is required, but the guilt can never be assuaged. Guilt is a means of self-control.